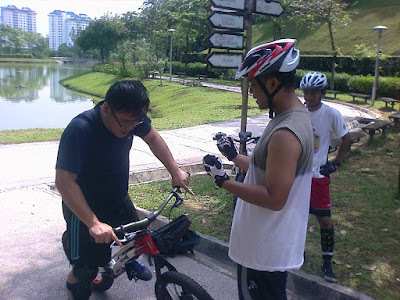 BikeTrials and a Fistful of Blisters: BikeTrials History in Bukit Komanwel Park? 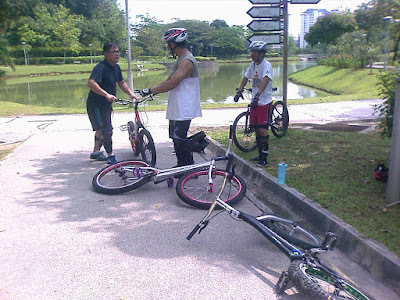 Today, 4 Malaysians (Syarul, Helmi, Wyatt and me) got together to share, learn and ride trials. This has got to be the largest gathering of Malaysian BikeTrials riders (with three trial bikes - Echo Pure, Neonbike and Adamant) in the history of Malaysia ever!!! LOL. This is indeed a great start to BikeTrial in Malaysia. Lets hope the community will grow from 4 to the hundreds!!!! Helmi is the proud owner of the Adamant, which he bought from Syarul a few months back. He is a quick learner. From what I heard from Syarul, Helmi could climb steps almost immediately... LOL. Syarul explaining to Wyatt about the finer points of track-stand on his Neonbike. Wyatt getting ready to take a ride on a trial bike for the first time ever. Wyatt took the Neonbike for a spin. He tried the hydraulic brakes and was shocked at how sticky the brake was... LOL.